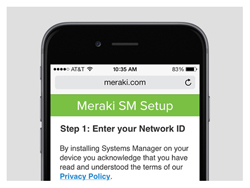 Meraki Systems Manager provides cloud-based over-the-air centralized management, diagnostics, monitoring, and security of the mobile devices managed by your organization. Manage distributed deployments of all of your devices with Systems Manager — without an on-site appliance. 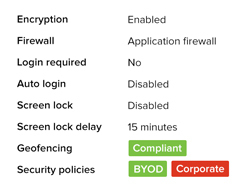 Managed devices connect securely to Meraki's cloud, enabling you to locate devices, deploy software and apps, deliver content, enforce security policies, and monitor all your devices through an intuitive and powerful web-based dashboard. Seamlessly manage and control thousands of iOS and Android devices, Macs, and PCs via Meraki's secure, browser-based dashboard. After enrolment into Systems Manager, managed devices automatically pull security policies and settings from the cloud. Systems Manager works on any network — even if the devices you are managing are on the road, at a café, or used at home. New features, updates, and enhancements are delivered effortlessly to the dashboard from the cloud. Meraki's cloud architecture provides the industry's only end-to-end solution which unifies WAN, LAN, wireless LAN, and mobile devices management under a single dashboard. Gain complete visibility and control from the top of the network to the edge using MX Security Appliances, MS Switches, and MR Wireless LAN, to the client devices on the network with Systems Manager. The intuitiveness of the dashboard enables IT professionals to configure and deploy in just minutes, without specialized training or dedicated staff. Pre-enrol devices or dynamically add users as they join your network. Deploy wireless and VPN connectivity settings, push apps and content, or restrict usage—based on user groups. Gone are the days of manual user-to-device assignment. Tie people to their devices by integrating enrolment with Active Directory. Scale your deployment to thousands and eliminate unknown devices in your environment. 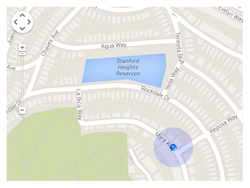 Devices are provisioned based on group enrolment, security compliance, and geofence location. Automatically deliver apps, network, and security settings specific to each user. Don’t mess with complicated SDKs or modifying application source code. Systems Manager Enterprise provides secure containerization using native OS tools, allowing secure data sharing among apps without complexity. Whitelist secure applications and blacklist unsupported ones to ensure only approved apps are used, and enable VPN on a per-app basis. Cohort and Cisco Meraki invite you to experience the power and benefits of Cisco Meraki's family of cloud managed network hardware and services in your own business environment with a Cisco Meraki Free Trial (up to $50,000 MSRP worth of hardware permitted) shipped to and received by you for free typically next business day. Furthermore, all Cisco Meraki orders placed with Cohort include a 30 day Return Policy!